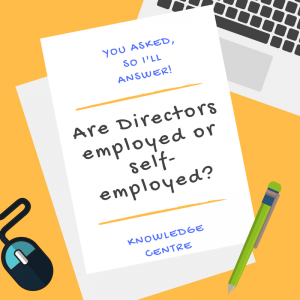 Are Directors employed or self-employed? You asked, so I’ll answer – Are Directors employed or self-employed? This is one of the most popular questions that social entrepreneurs ask, as they are keen to receive their income from the organisation in as tax efficient way as possible. There are specific rules that mean if you are a Director of your organisation you are treated as an office holder by HMRC, and this means any payments you receive for your role as a Director must be as salary and subject to PAYE. There is the option to treat any activities that do not form part of your Director role as self-employed, providing there is sufficient distinction between the two roles and you meet the rules for being classed as self-employed. So, if you are able to split your strategic and legal responsibilities as a Director from delivery on programmes/projects it may be possible to do this. It is also better if you also have other work you do as a self-employed individual in addition to the work you invoice your organisation for; otherwise it would look like an artificial separation of your income simply to avoid paying tax. If you are working full time for your organisation then this route is not generally recommended, as you do not meet the criteria for being self-employed (see below). There are also different rules in place if your organisation is a charity – as there are restrictions on the number of Directors (trustees) that can be paid, and they cannot be paid for the duties as a trustee – only for additional goods or services they provide. This is providing your governing document allows payments to trustees. The rules for charities require you to not pay more than half of your board/trustees (or a person connected to them) for goods or services, and for the trustee to not be involved in decision making regarding the purchase or agreement. Further details and information for charities is available from https://www.gov.uk/guidance/payments-to-charity-trustees-what-the-rules-are. Are you employed or self-employed for work that is not part of your Director role? The right to provide a substitute – if you are employed you cannot send a replacement, whereas if you are self-employed you can send someone else to complete the work. In your capacity of Director you are not able to send a substitute – but are you able to send a substitute for any service delivery work you do? If you are, then this aspect may be able to be treated as self-employment income. Mutual obligation – as a Director you are obliged to do as the organisation (your employer) requests and your employer is obliged to provide you work, whereas if you are self-employed you can turn down the work if you wish and the organisation is under no obligation to offer you any work. Control – the organisation will control where, what, when and how the work is done, whereas if you are self-employed you will have control over the majority of these. Provision of equipment – an employee will usually have the equipment required to do the work supplied by the organisation, whereas if you are self-employed you will normally supply the equipment yourself. Financial risk/profit – as an employee you will normally have little financial risk as you will be paid (unless you are commission based) and you will not benefit from any profits generated (unless you are part of a bonus scheme linked to profits). If you are self-employed you bear the risk if the work takes longer than anticipated and will be liable to correct anything at your own expense – but you also potentially make a profit if the work is completed more quickly. Contract length – as an employee the contract is usually open ended with no fixed end date. Whereas, if you are self-employed you will usually be working for a fixed term contract. Do you have a website and marketing materials? Do you have other clients in addition to your own organisation? If you were previously employed by the organisation, and then switch to self-employed, but continue to carry out the same role HMRC would challenge that you are genuinely self-employed. The main difference for your social enterprise is that usually self-employed individuals will be cheaper as you do not have to pay Employer’s National Insurance Contributions and pension contributions on top of the individual’s salary. But, with the Employer’s National Insurance Allowance meaning you do not pay the first £3,000 of contributions, it may not make much financial difference. There is also the Intermediaries Legislation (IR35), which treats the individual as an employee. This applies where the individual has their own company and invoices the organisation for their work, but if it were not for the limited company, they would be treated as an employee of the organisation. In these circumstances, any income received by the individual through their own limited company must be paid out as salary and subject to PAYE. For a Director, if you subcontract work to them from the organisation, and this is their only source of income for their own limited company, then IR35 applies. If the Director is genuinely self-employed and does work for other people outside of the social enterprise, has their own business cards, can send a substitute etc. then he can potentially be treated as self-employed for this work – so the Director could invoice the organisation from their own company. The above information is a guide, and you should seek advice in relation to your personal situation and circumstances if you are unsure whether you are employed or self-employed.